Making a live action film or animation video is not a simple process. One needs to plan well and needs to execute everything as designed or planned. A storyboard helps the team to understand the director’s vision and helps everyone stay on the same page. The storyboard illustration should be clear and should cover the essential elements of a film, like the characters and other elements needed to shoot a film. Also, in the templates, you would get the option to insert your images which you can add these to the primary reference. The icons help in executing a complete draft without omitting any vital element from the storyline. The storyboard is a great way to offer illustration to have a complete view of the project on hand. Designing a storyboard that is intuitive and creative is essential for any kind of movie, illustrations, and other audiovisual work. By using these template designs, one can insert slides that are based on the story or context. The animated clipart designs and templates let you choose from multiple icons and illustrations. 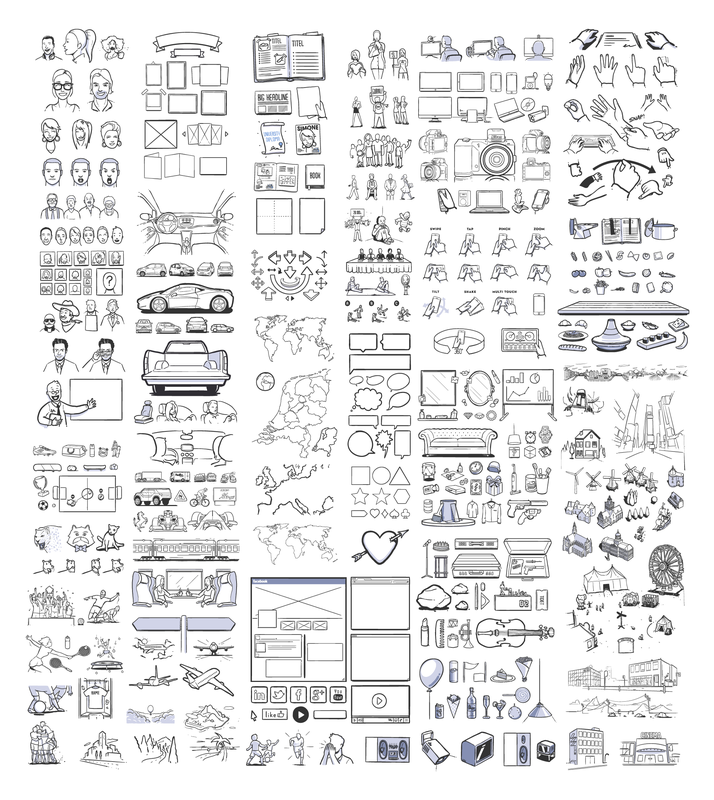 The final storyboard may have a combination of these hundreds of icons and illustrations, which can be used multiple times. The vector-based icons have a definitive work which helps the designers get a better idea of the final project. There are endless designs in the area of icons that the designer can use at various stages as the project moves forward. These icons can help the project to cover one stage after another and hence the makers can also understand the progression of the project. The illustrations and storyboard help the creative director or designer to communicate better with other department heads. Also, the designers and the personnel working on the project are on the same page and are hooked on the same idea. The final PSD files can be shared with each person working on the storyboard, and it will help in the final output. The color palette can be chosen according to the theme of the story, and also how the different elements of the same theme interact with each other when color is added to it. The project can be edited in Adobe Illustrator, Photoshop or Design, according to the intended customization. There is various software in the area of film and animation making where a number of designs can offer great value-addition to the project. The execution of an idea without a storyboard is not a simple task. People working on the same project may visualize the same storyline in different ways. The set of icons, which have different objects, sports, maps, logistical elements can let you design the storyboard in an efficient manner. More options help the designers to innovate and create a better storyboard based on the same storyline. You can also add some fresh stock photos from your side, and this helps the designers to add some more layers to the icons and illustrations. Hence it can streamline the whole project in an effective manner that can offer a brilliant idea of the project to each person working on it. The layers and icons in the storyboard illustration are vector based so they are easily scalable, and you can alter the icon size and make it big or small according to your need. The PSD files that will be provided are totally editable. The illustrations will help you create a detailed storyboard for your movie or project. The vector storyboard illustration set is totally free and can be edited in Photoshop or InDesign. You can add a lot of objects relevant to the storyboard, and all these points make the storyboard more detailed.